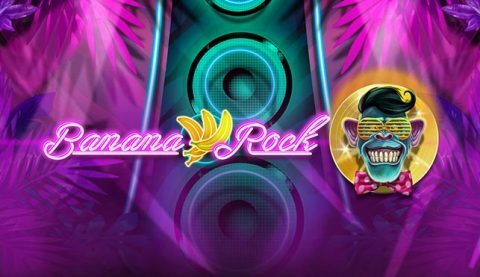 PLay’n Go released a new online slot game, Banana Rock. Banana Rock uses 10 lines and a monkeys playing instruments theme. Which somehow I have seen before, no idea why these monkey themes seem to be popular, because I personally don’t like it at all. But this doesn’t mean I don’t like the game itself. Wild symbols appear on all reels, bonus symbols only appear on reel 1 and 5 and the highest paying symbols, the monkeys, can appear stacked on all reels. Banana Rock comes with two different bonus features. Landing two or more wild symbols will award one free re-spin. Before the spin starts the rightmost wild will connect with the leftmost wild connecting all other wild in between. All places in between will become a wild symbol, which stay there for the free re-spin. Get both bonus symbols on reels 1 and 5 to receive 10 free spins. Each stacked band member appearing on a full reel will increase the multiplier for that symbol up to 5 times. Each bonus symbols appearing during free spins will add 1 more free spin. At the end of the free spins bonus you will receive one Encore Free Spin. All collected multipliers will be added up and you will get 1 free spin with only high paying symbols on the reels. You can collect a maximum of 25 times multiplier for the Encore Free Spin. I would suggest giving Banana Rock a try, I think a lot of players will love this game. I especially like the free spins feature, this is rather unique, and I like that. Banana Rock is available at all online casinos that offer Play’n Go slot games, which most NetEnt casinos do. But why not try it at Lapalingo? At this online casino you can claim €10,- no deposit, so you wouldn’t have to make a deposit to try this new game. Also watch the promotional video below for a better impression of the game.